Jotter - n: a small notebook for rough notes. Observations of post-OR Ukraine, expat life in Kyiv, and about managing a company American style in a post-Soviet "business" culture. 07:20 Hotel Victoria, Donetsk. I open the curtains. Everything I see is a shade of gray. I turn on the T.V. and flip through the channel line-up twice. There appears to be no Channel 5 (Piatyj Kanal). Maybe it's not broadcast in Donetsk. I do find a talk show that happens to have Ilya (Chychkan) and Masha on it. 08:50 Road to Dnipropetrovsk. This will be the shortest leg of my trip. The roads are in decent shape. Several road crews repair the many post-winter pot holes. Does it make sense to fill potholes in sub-zero temperatures? In Dnipropetrovsk the Party of Regions has a solution to the economic crisis. If you get laid off sue your employer. Oleh Zareva's Center for Social Programs will help you to "Defend Your Right to Work!" reads the billboard. Vladimir Ilich Lenin, circled by the capitalist advertising of UkrSibBank, NOKIA, and others looks over a makeshift parking lot in the center of Dnipropetrovsk. I keep my eyes open for social unrest and don't see any, at least not today. Today shoppers are still parking in front of Lenin and scrambling into the TSUM (Tsentralnyj Univermah) Department Store. Beyond Lenin's parking lot is a shopping mall under construction. Crews were working and the cranes were moving. There are a few "For Rent" signs on recently closed retail businesses on Dnipro's main street. The retailers that are still open have plastered their windows with large sale and discount signs. A sign of the times: "Final Sale"
16:30 Meeting with our Dnipropetrovsk Dealer. The conversation revolves around the lack of credit availability at banks and how it's stifling his business and those of his friends. Demand for luxury products has evaporated he says. He is heavily invested in luxury vehicle brands and owns multiple dealerships. Fortunately, those facilities were not built with borrowed funds, nor were they leveraged for other investments. This supports the going theory that Ukraine has not had a chance to fully develop into a highly leveraged society, as opposed to other Eastern European nations like Poland, Bulgaria, and Hungary. Our meeting ends punctually. He is a big Deep Purple fan and Ritchie Blackmore's band "Rainbow" are performing tonight. A sold out show in Dnipropetrovsk at UAH 400 per ticket. 18:50 On the way back to the hotel, I stop for a look around his latest dealership built for a luxury Japanese make. The service manager gives me a detailed tour of the workshop and is very kind to answer all my questions. 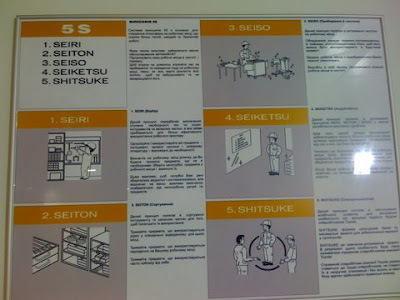 I am most intrigued by the Japanese 5S Methodology poster on the wall. The text is in Ukrainian short of the five Japanese words. "It's part of our Kaizen" explains Vadym handing me a book about Kaizen in Russian translation. "It's truly a great thing. We work on it together". The cleaning lady, rests on her mop, and having overhead our conversation asks if I'm from Western Ukraine. She herself is originally from Rivne. Has she felt the impact of the financial crisis? So far so good she says. She is still employed and so are her loved ones. I make my way back to the hotel pondering the fact that I apparently know one of the world's few, or possibly only, non-leveraged car dealer. Kaizen.